Simple Wet Flies - Fly Angler's OnLine "Intermediate Fly Tying Part 48"
Again, I saved wet flies until this time to keep the procedures fresh in your mind when we get to the flies we'll be tying in a few weeks. 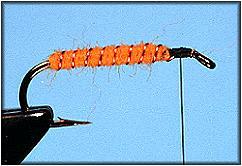 This week we'll play with soft hackles and how to wrap them around the hook to achieve the proper look and action. Wet flies imitate emerging insects for the most part. In larger sizes, they also imitate small minnows, but mostly they are tied to imitate emerging aquatic bugs. They have a breathing and swimming action that will turn the most cautious fish into a feeding fool. I think the folks who attended the 1999 FAOL fish-in will vouch for me on that statement. You often read about emerging insects "drifting" to the surface of the water to emerge. In some cases, that's true, but many insects swim to the surface and bust through the surface tension with some force. That's probably nature's way of making sure the insect will survive the trip. The surface tension of the water is strong enough to hold an insect's weight and more. Those insects who just drift to the surface (many mayflies come to mind) often have a very hard time breaking through the tension of the water's surface to emerge as adults. After a while, they become exhausted or drown and just drift away in the current. Those drifting nymphs and pupae are also prime candidates for imitation with a wet fly. A lot of aquatic insects put effort into the swim to the water's surface. They swim to the surface, deflect off and swim back at it again. Sometimes this swimming action is across the current, sometimes it's with the current and sometimes it's against the current. That's why you can often fish a wet fly in many different fashions and achieve good results. 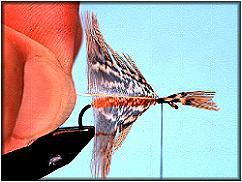 The classic wet fly swing is used to imitate active emergers. You cast across the current, let the fly sink a little, tighten the line and let the fly swing toward the surface, and twitch the rod tip to look like an emerger that is pounding on the surface tension trying to break through. Dead drifting and pulling the fly across or against the current also work quite well. This is the time when aquatic insect life is the most vulnerable. The fish know it and look for signs of an emerging insect. Fish usually take wet flies with an aggressive bite. 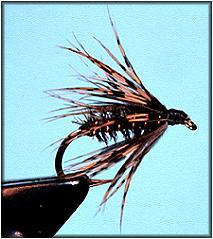 Wet flies are exceptionally productive flies that can be fished in just about any manner you wish to fish them. The first flies used by fly fishermen were often wet flies or streamers. 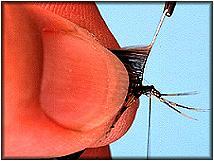 Dry flies are relatively new creations compared to wets and streamers. If you're purely a dry fly fisherman, consider the action you might be missing. Why fish with only a portion of the possible offerings when you can present the fish with a full meal deal? Think about it a moment. Are you missing out on some of the best fly-fishing to be found? 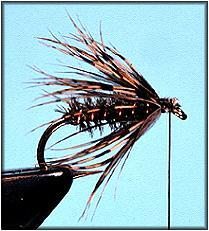 The Deerfield Special was created to imitate emerging sedge (caddis) on Deerfield Lake, here in the Black Hills. I use it in more places than just lakes. The fish don't mind, they just try to eat it anywhere I use it. Hook: Any wet fly hook that's 1X shorter than standard (I'm using a Mustad 3399A hook). Sizes 12 to 18. 1. 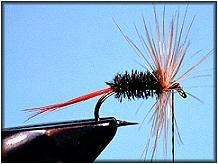 Start the thread and tie in a tail of red hackle fibers. 2. Wrap a peacock herl body as shown. 3. Tie in the hackle, curvature down and back. 5. 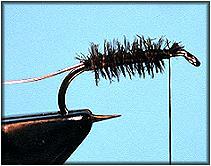 Pull the hackle back and wrap thread over the front part of it to give the hackle a slight sweep. 6. Add a mallard flank feather wing as shown. Try not to use too much or too little wing. This is about the right amount. When the wing is attached, make a smooth head, whip finish, trim and cement your knot. 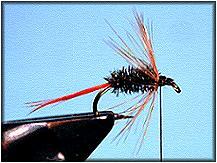 Soft hackle wet flies are the other common type of wet flies. 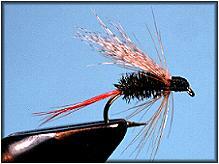 Sylvester Nemes has written several books on this style of wet flies. They are worthy of your reading. Bead heads can be added for a different effect. I don't always stick with the traditional way of tying or the traditional materials for soft hackles. Sylvester liked using partridge feathers most of the time, I often use grouse feathers or pheasant feathers because I like the colors and patterns of those feathers. It's your choice as to what you wish to use. Hen neck hackle also works rather well. If you're a bird hunter, the raw materials are just one hunting season away. Hook: Any standard wet fly hook. Sizes 10 to 18. Thread: Black 3/0 or 6/0 depending on the size of the hook. Body: Peacock herl or olive dubbing. For an interesting effect, try green mylar tinsel as a body material or a rib. Rib: Red copper wire. Other colors of wire or tinsel can be used to create the right color combination to fool your fish..
Hackle: Feather from the back of a sharptail grouse. Many other feathers will also work including partridge, hen hackle and other game bird feathers. 1. Start the thread and tie in the ribbing wire. Weight can be added if desired. 2. Wrap a peacock body as shown. 3. Rib the body down with the wire. I usually wrap the wire the opposite direction of the body materials. 4. Select a grouse feather and strip the fuzz from the bottom of the feather. Next, fold the fibers of the feather back against the grain of the feather as shown. Tie in at the tip of the feather as shown. 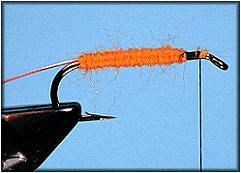 Trim the excess feather at the eye of the hook. 5. As you wrap the hackle, use your fingers to fold and pull the feather's fibers toward the bend of the hook so that only the shaft of the feather is near the hook eye. 6. When you finish wrapping the hackle, tie it off and wrap the thread over the front of the hackle to give it that swept look. 7. Build a smooth head, whip finish, trim the thread and cement the head. Your finished fly should look similar to this. 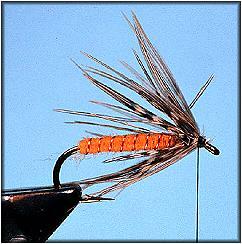 The Carey Special is a soft hackle wet fly that's often used as a salmon or steelhead fly. 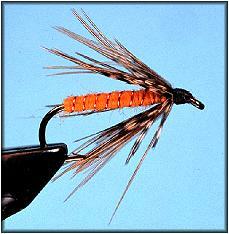 The tying steps are basically the same as the soft hackle caddis pupa. I'm showing it to you because it uses different materials and a different hook. 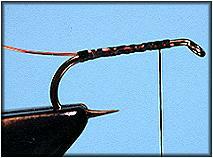 Hook: Any standard wet fly hook, 1X long. Sizes 1 to 14. Body: Orange dubbing, floss, punch embroidery yarn or Rainy's No-Dub. Other colors and materials can be used to achieve the desired color and texture. Rib: Red copper wire. Other colors of wire or tinsel can be used to create the right color combination to fool your fish. Hackle: Feather from the back of a ringneck pheasant. 2. Wrap or dub a body as shown. 3. Rib the body down with the wire. 4. Select a pheasant feather and strip the fuzz from the bottom of the feather. Next fold the fibers of the feather back against the grain of the feather as shown. Tie in at the tip of the feather as shown. 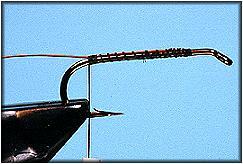 Trim the excess feather at the eye of the hook. 5. 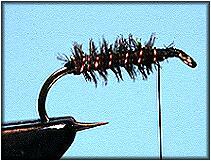 Wrap the hackle the same way you did in the soft hackle caddis pupa. When you finish wrapping the hackle, tie it off and wrap the thread over the front of the hackle to give it that swept look. 6. Build a smooth head, whip finish, trim the thread and cement the head. Your finished fly should look similar to this. 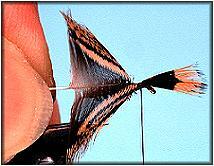 Practice wrapping hackles from birds other than the standard hackle feathers you use on dry flies. We'll use this procedure a lot in the weeks ahead. Some other birds that are commonly used for soft hackles include other game birds, starlings, most ducks and a host of bright colored exotic birds. I'll keep my selections to common birds you can find easily.